Looking for a manufacturer of Underpads and interested in importing or distributing StayDry Underpads? INQUIRE WITH US to become an official StayDry underpad distributor. 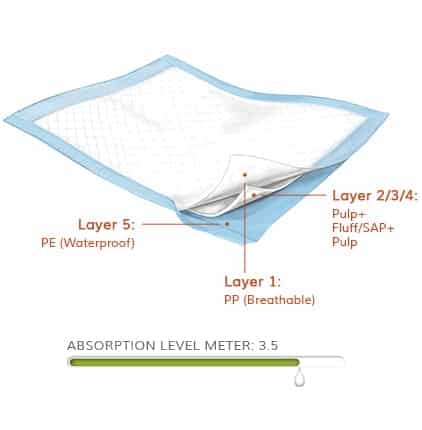 Multiple layers of absorbency and waterproof bottom layer ensure dry surface beneath. A soft, non-woven surface has ventilative properties to keep skin dry and comfortable. High quality Fluff Pulp and SAP (Super Absorbent Polymer) absorb and trap liquids. Waterproof film on the bottom layer protects beds, chairs and any surface below the pad. StayDry Underpads provide unparalleled protection and absorption for hard to clean surfaces. 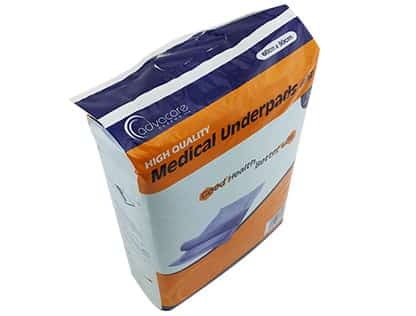 Ultra absorbent, our underpads have innovative and effective features that provide the same level of protection as other leading brands, but at an affordable price focused on meeting the demands of our underpad distributors in the developing world. 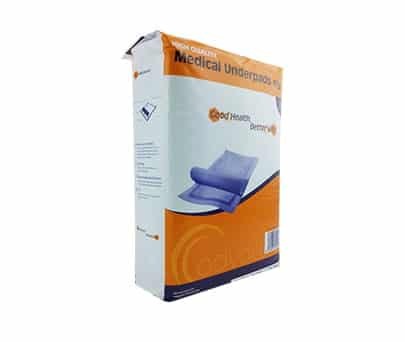 An underpad is a superabsorbent polymer designed to protect surfaces such as bedding, chairs and others they offer an additional layer of convenience and peace of mind during their period of illness. 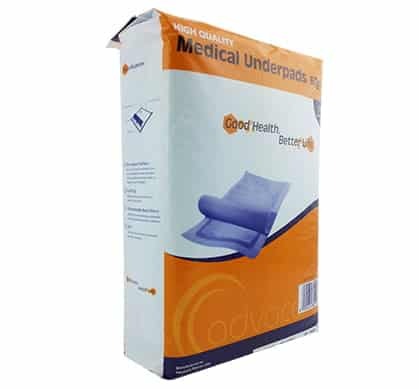 Underpads are often necessary for children and adults with various medical conditions including incontinence, immobility, severe diarrhea and dementia. 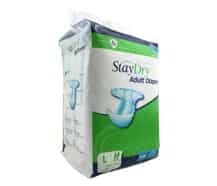 StayDry Underpads are made from a combination of high quality fluff pulp and superabsorbent polymers for immediate and effective protection against leakage. StayDry Underpads offer superior liquid absorption and comfort compared to competing brands. Our underpads have been designed according to exact specifications that ensure that unwanted odors and unnecessary moisture are things of the past. What sets StayDry Underpads apart from our competitors? StayDry Underpads are designed to ensure both maximum absorption of unwanted moisture and a premium level of comfort. To this end our Underpads are manufactured with high-quality cotton to ensure maximum absorption of undesirable moisture while providing a breathable quilted base. StayDry Underpads unique design ensures that odors are kept to a minimum. They also include anti-slip back sheets to guarantee no unwanted movement of the protector. 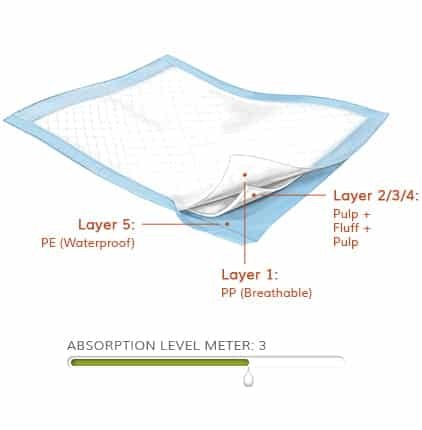 StayDry Underpads are also padded for additional patient comfort. 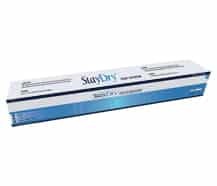 Due to StayDry’s vast experience in manufacturing health care products we are able to leverage our significant economies of scale in manufacturing to provide quality underpads and other incontinence products for a fraction of the expected cost. StayDry Underpads offer exceptional protection at a reasonable price compared to similar products available internationally. Our careful attention to detail means that additional features such as non-slip backs and additional breathable cotton ensure that consumers and health organizations around the world rely on our Underpads to provide peerless protection and comfort. GMP, ISO, CE and USFDA certified we recognize that consumers and hospitals require our products to be manufactured to exact high standards and we guarantee that our products will exceed your expectations. How to Use Under Pads? Use of Under Pads are an easy and effective method of controlling uncontrollable urinary and defecation occurrences. Below are some tips for the safe and effective use of StayDry Under Pads. Cleaning up a soiled under pad is fast and easy. Pull the under pad up and away from the bed or other surface where it was laying. Quickly place in a trash can or in a plastic bag to conceal any odors. Use of duct-tape or masking tape on the bottom surface of an underpad can help hold the pad in place on a slippery surface. Some users prefer adult diapers over underpads based on convenience. But underpads can be more comfortable as the underpad is not attached to the body. 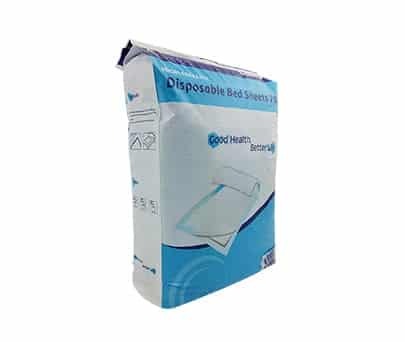 While under pads are most suitable for placement on the surface of a bed, they can be used on any flat surface. Under pads should be utilized mostly for nighttime purposes to protect both the user and the underlying surface from any accidents. Using these pads unnecessarily is expensive, a waste of resources, and can lead to lazy habits if the user is physically capable of using the restroom. For increased protection of the underlying surface, consider a waterproof mattress pad. This will ensure a completely dry surface if the under pad is overly saturated or unknowingly slides out from under the user. Make sure to change underpads once soiled as not doing so can lead to mold and dangerous odors. I think I need an underpad but I’m not sure how to use one? A: Underpads are simple and versatile and can be used in a variety of situations for nearly any user. Simply place the pad on top of the surface you wish to keep clean. Whether it be a table, bed sheet, mattress or dog kennel, the underpad will keep all surfaces dry, clean and odor free. When used in conjunction with bedding, it is recommended placing the pad underneath the sheet for maximum comfort, as long as the bedding is washable. Should the bed sheet not be disposable or washable, it is recommended the underpad be placed on top. 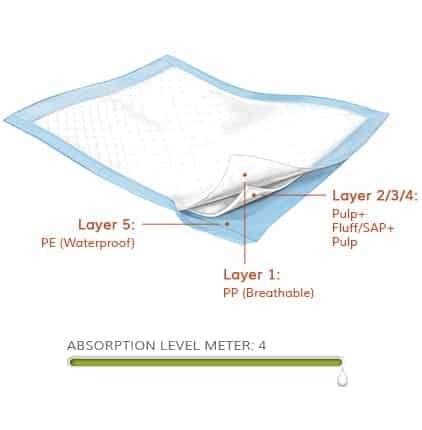 A: StayDry underpads provide proven protection and breakthrough technology to absorb leakage, reduce odors and control bacteria. The breathable material resists tearing and allows heat to escape. So you, or your loved one, stay secure, dry and comfortable. 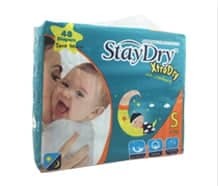 StayDry underpads are also excellent purchases for individuals in developing countries who need an affordable means to keep their mattresses and living spaces clean. We offer both deluxe underpads as well as standard underpads for a lower price. Both the standard and economy versions will keep the user and their surrounding protected from unwanted fluids. Are there any disadvantages to using underpads? A: They are not absorbent enough to be used as sole protection for bladder leakage and move around too much to be used reliably for bowel leakage. Because the material is relatively light-weight they have the ability to fold up and crease beneath the user. Unfortunately this may lead to misalignment when not used properly. This product is not to be used in place of disposable adult diapers or baby diapers (LINK to our disposable diapers). They can be substituted for mattress pads or mattress protectors. 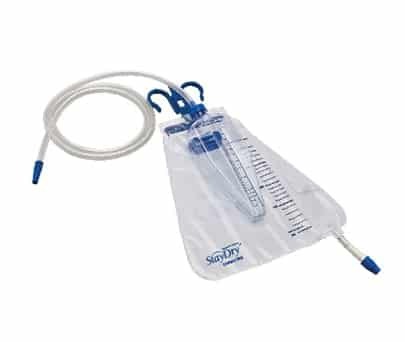 I have bowel leakage, can I use underpads? 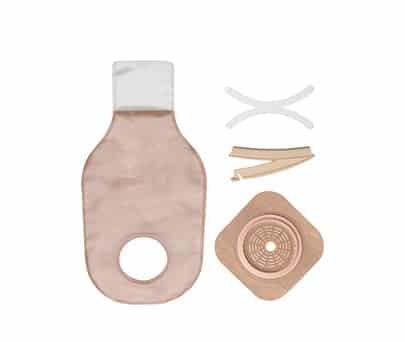 A: People with bladder and/or bowel leakage it is recommendable to use disposable under pads as backup protection in conjunction with a body-worn pad. However they are not recommended for use as sole protection. Are incontinent pads only used for incontinent patients? A: In hospitals and other medical settings underpads are often used to soak up blood, chemicals and other unwanted or otherwise harmful substances. They may be used in coordination with a hospital gown to help protect patients or their staff from open wounds or to stop blood loss. Although a mattress pad, isn’t the first choice in these situations, they are just as effective as large bandages or gauze. 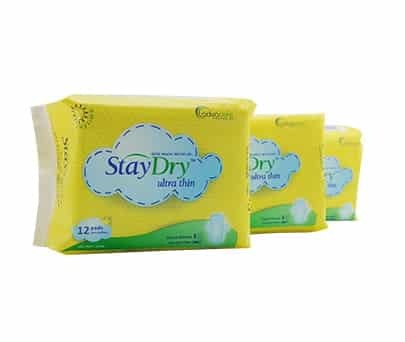 © StayDry Incontinence Products. All rights reserved. Subscribe to our Newsletter to receive price and news updates!